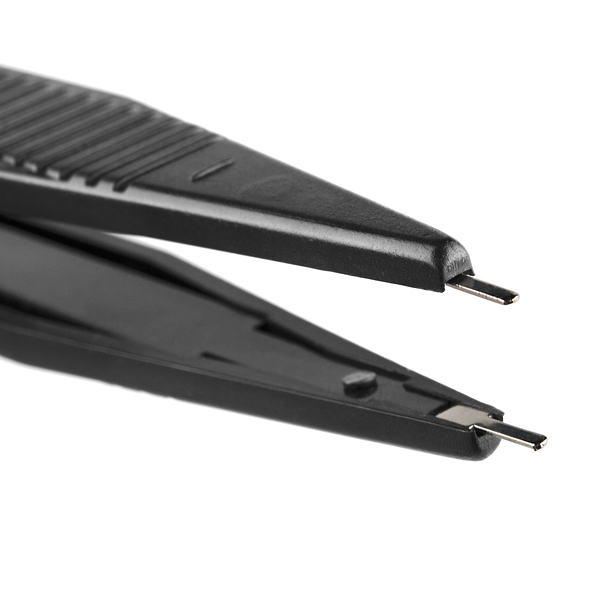 Tweezers are 6" long with 10mm open clip distance. Wire lead is 16" from tweezers to jacks. Holy hell I've been wanting something like this for so long! Holding those obnoxious multimeter probes is such a chore and their damn cords keep getting tangled. When I worked as a repair tech, I often had a pcb for repair that had an excess of 50 micro relays on board, each needed to be tested and replaced if defective. 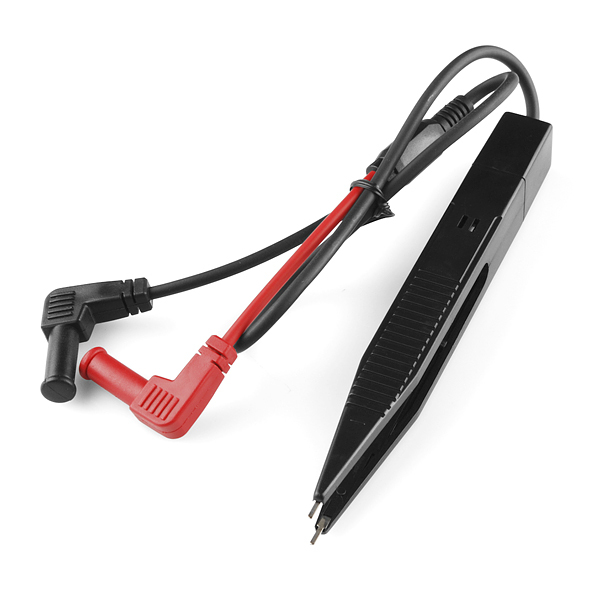 I used something similar to these tweezers for my bench meter and power supply so i could power each relay individually with one have and probe the contacts with the other, these are absolutely a much have for the home bench, they will come in handy! I think I ordered this exact thing on deal extreme a couple years back. The test points were flimsy, and prone to becoming misaligned or otherwise useless. The probe tips are made of soft metal so they are easy to bend, and they are not [easily] replaceable. The actual probe tip measurements are 0.375" (9.5mm) between tips and each tip is 0.050 (1.27mm) wide by 0.016 (.41mm) thick by 0.20" (5mm) long. The cable length from the probe handle to the jacks is 16.5". A great tool for probing SMT parts and lighting up SMT LEDs. Buy 2 of these so you will have a spare for when the tips wear out (they will eventually break off due to bending and straightening). They look pretty small (check the zoom photo, at 10mm between those tips I'd estimate them to be 0.2mm thick and <1mm wide) but they also look capable of probing tiny components. IC pin hooks, test probes, chip clips, and the like are notoriously flimsy. However, they're not designed to be your day-in, day-out measuring tools that kick around your desk. They're designed to be awesome when you really need to probe a tiny SMD component. And they are. Buy a couple in case one breaks. you can easily measure a 0603 SMD resistor or cap with these. not good for ICs really though. For $5, they're worth every penny. Just realize, they're $5... they aren't going to be 'precision', but will work for most things. I have an old Fluke DM252 that has regular (not shrouded) banana plugs on the leads. Is there any way I can get these to work? Take a knife to the jacket. If you do any surface mounting this tool is a must. I plan to mention it in another article I'm writing for Nuts and Volts July issue regarding building of "FIREWORKS" earrings. The earrings use 805s & 603s surface mount components. When the tweezers are connected to the "diode" mode of a DVM they will fire up the led and tell you where the cathode is. When connected to the "ohm" mode they will tell the resistance of a resistor. When used with a capacitance meter you can sort capacitors. Great for on the board checking also. You get what you pay for. These are very cheaply made and arrived with a bad internal connection. Flimsy plastic. If you want a quality tool, keep looking. Hi, If you are not satisfied with your part, please don't hesitate to contact us via our Returns page -- https://www.sparkfun.com/returns I have emailed you about this issue. We'll get you taken care of. 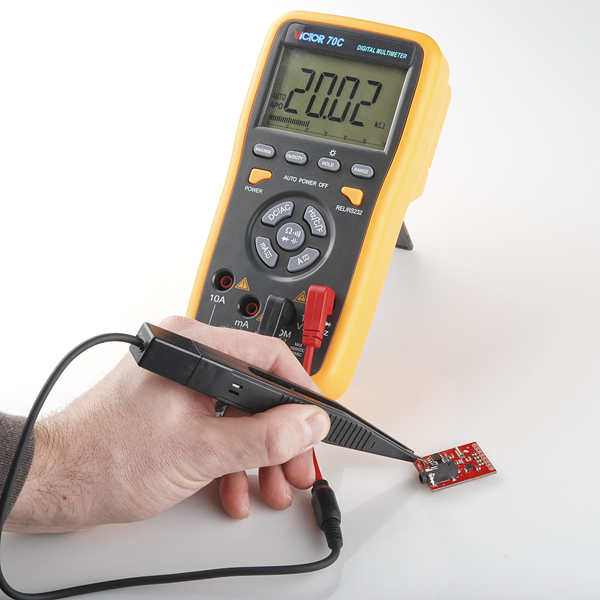 These make it very easy to measure voltage with only one hand. They're kind of cheaply made, but a great deal for $5. I'd love to buy a $10 or $15 version with quality to match. They are big - bigger than needed for surface mount parts. That leads to more C or L to null out when measuring low value parts. But they work. The tips are soft. You must short them together to calibrate an inductor reading - but if you use too much force the tips bend. A sturdier material, but with a high conductivity, wear resistant coating would be a better design.